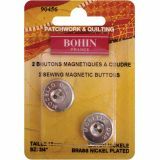 Magnetic Sew-On Button 3/4" 2/Pkg - BOHIN-Magnetic Buttons. Magnetic sew-on buttons. Nickel-plated brass buttons give a unique look to your hand-made projects. Sew-on just as your would a regular button. This package contains two 3/4 inch/18 mm buttons. Imported.